Neighbors present: Chair David Aschenbrenner, Sarah Smith, Linda Hedges, Wally Bischoff, Melanie Bocek, Shirley Geiter, Steve & Bonnie Rand, Darlene Anderson, Ruby Inman, Darin Smith, B Heather Ray. Guests Mark Dane and two others from Railroad/42nd Subdivision development project. Police report: Captain Rash joined us and reported that there is the potential for more crime in the neighborhoods, such as thefts from cars and mailboxes, ID theft using materials from recycling bins, opportunistic crime by meth users. Please be careful about locking vehicles, doors to sheds, not leaving valuables in plain sight, shredding correspondence. Captain Rash reminded everyone to report any suspicious activity that they see because it could be related to these opportunistic crimes. Non-emergency police number is 503-7867500.The Department is sponsoring the annual Prescription Drug Turn In and Shred Day 10am-2pm on April 29th. Tuesday March 14th is the Officer and Cadet of the year dinner. The 100th anniversary of the police department will also be celebrated at the dinner. 23 officers from Milwaukie PD and Gladstone partnered again this year to raise funds for Special Olympics by participating in the Polar Plunge, a quick dip in the Columbia River in January. They raised $7700, the most for a law enforcement team in Oregon. He also encouraged people to think about participating in the 9K for K9 fundraiser for Milwaukie PD’s K9 program on July 8th, at Milwaukie MarketPlace. For more information go to www.Milwaukiepsf.org. Milwaukie Friday Memo: Forwarded by email to our email list. committed to bench project, $500 MHS Grad Party (on condition of work party). Balance available $5389.13. 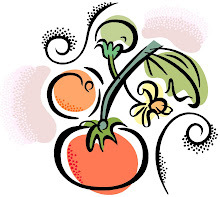 Parks & Garden Report: Sarah Smith reported all the plots are rented and there is a waiting list. 19 pounds of produce has already been donated to Esther’s Pantry. Mason bees are hatching and she had some to provide to gardeners at the meeting. She said the new rainwater tank was about half full (it’s a 275 gallon tank.) A pop up canopy has been purchased for use during classes or poor weather. Public Safety Report: Heather Ray discussed the Safe Access for Everyone (SAFE) project and distributed a list of the projects determined by work parties that are high priority on the many projects around town that should be covered by the new funding. She said that the federal government has mandated that all sidewalk projects previously installed by the city must now have the standard ADA ramps and other work in currently approved designs. She asked neighbors to prioritize the projects on the “high priority” list. There were four that the group at large felt should have highest listing, which were the pedestrian-activated crosswalk at King and Home Avenue, 42nd Avenue sidewalk infill, Harvey Street sidewalk infill and Stanley Avenue from King Road to Railroad sidewalk infill. Home Avenue sidewalk infill received medium support but only as infill on one side or the other as it corresponds to available right of way, not both sides of the road. The projects list is attached and neighbors are asked to complete their list of priorities and send it to Heather Ray. provided at the NDA meeting on March 13, 2017. Sarah Smith moved, Steve Rand seconded, unanimous approval. Action: D Aschenbrenner to report support for project to Mark Dane and to City staff. Grant Request: Rowe Middle School’s Food for Success program submitted a request for $1000 to support this year’s healthy snacks for middle schoolers. Shirley Geiter made a motion to grant them $500, Darin Smith seconded, passed unanimously. Grant Request: MHS Grad Party. Still waiting to hear back from Yvonne McVey regarding a work party of students to earn the $500 set aside. Action: LH to create list of suggested projects for them to do at Homewood Park and contact with NCPRD for the work to be done, email to Ms. McVey. Neighborhood News: A list of properties in the neighborhood that have been foreclosed and their disposition was attached to the agenda. The meeting adjourned at 8:00pm The next meeting will be held Monday April 10th, 6:30pm. Past meeting notes and treasurers report: Linda Hedges was unavailable due to a CERT event. Community Garden: The total produce donated to Esther’s pantry in 2016 was 1, 251 pounds; this is down a bit from previous years, Sarah attributed the lower total to poor fall weather, poor supply of late season plant starts, and less volunteer involvement. There are 2 new gardeners just coming on to the garden and there are 3 open plots, registration is open at: http://www.campbellgarden.org/p/ccg-registration-form.html The rainwater harvesting system is moving forward with the donation of a 275 gallon tank from Alexeli Vineyards. New projects for 2017 are a more focused approach to planning the harvest donation program and the purchase of grow lights for seed starting. Homewood Park: In December the Parks District worked on removing a few cherry Trees, the wood was chipped and will be used as mulch for new plantings later this winter. Sarah will contact the Parks District about having High School Grad Party volunteers plant plants or remove ivy, and will have Linda Hedges follow up with Milwaukie High School. Public Safety Report: Heather Ray: Nothing new to report, they haven’t had a meeting yet. Mission Park Development: Ley Garnett reported on the status of our neighborhoods appeal of the Planning Commissions approval of the proposed 14 lot development on SE King Road. Our appeal submitted by Ley was received by the City Council, the council will have a public hearing on our appeal at the regular council meeting, Tuesday January 17th. Information on the appeal can be found in the Councils E-Packet, scroll to Agenda item #5, pg 45: https://www.milwaukieoregon.gov/sites/default/files/meetingagendas/2017-0117-rs_agenda_revised.pdf Neighborhood members are encouraged to attend the hearing. 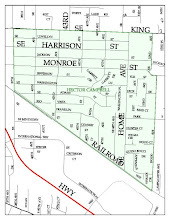 Ley believes there is a 54” Ponderosa Pine on the property as well as many other mature trees, tree protection and the variance for putting a new road into King Rd too close to the Home & King intersection are our neighborhoods main reasons for appealing the Planning Commissions decision. 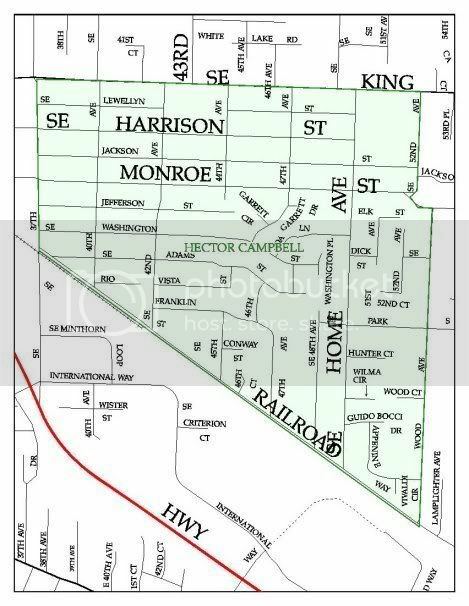 Zoning, density, demolition questions: There was discussion about future development in our neighborhood, a neighbor brought up the fact that a home at SE 55th & Monroe was demolished, and it was asked if the NDA gets any notifications. Concern was expressed about what will become of the large open lots along RR ave, at the time of the meeting it was noted that there was no known property for sale, however signs have popped up at 4217 SE RR Ave for 3.21 acres for sale. Questions were also brought up about whether or not Milwaukie is making progress on developing a tree ordinance, David Aschenbrenner will follow up on what notifications we should receive and on trees. 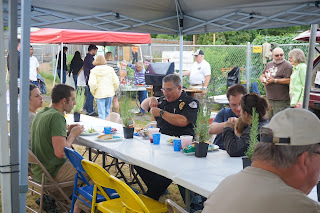 Police report: Chief Bartols joined us and announced the 100th Birthday/Anniversary of the Milwaukie Police Department. They have special social media posts through out the year, as well as at the Officer and Cadet of the year dinner. We were reminded to not leave our cars unattended while warming up, thieves are look for cars to steal. NOTE: We expect the weather to improve, if the meeting is canceled due to ice we will notify our email list Monday afternoon.